There is always the news about some food companies got bankrupted because of the food problem. While in many countries, less people know about the truth and the food company still works well and produce the food with something bad for us. How to solve the food problem in a better way is always what we think about. So there is the coming out of the touch screen conveyor belt food metal detector with buzzer alarm which is the angel to protect our health. There is always the news about some food companies got bankrupted because of the food problem. While in many countries, less people know about the truth and the food company still works well and produce the food with something bad for us. How to solve the food problem in a better way is always what we think about. So there is the coming out of the touch screen conveyor belt food metal detector with buzzer alarm which is the angel to protect our health. Where you can best buy this helpful food metal detector? Here we highly recommend this online store www.jkdcsecurity.com for you and your company. Do not let the bankrupt happen to your food company. You should ensure your products quality first. The food problem exists all the time, even the government has made some rules to forbid the illegal business, still many manufacturers produce bad food for making more profit. Some food companies don’t care about if they can capture the market for long time. They only care about the profits, so it is easy for them to ignore the food quality. In long running, the problem will lead these companies to the end of bankrupt. How to reduce the food problem? 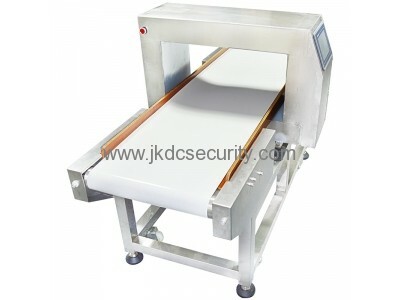 Many managers of food factories have been wise enough to best this touch screen conveyor belt food metal detector with buzzer alarm, which is used for the detection of meat, mushrooms, candy, drinks, food, fruits and vegetables, dairy products, aquatic products, health products, additives and flavorings and other food-ferrous metals and non-ferrous metal impurities. This food metal detector you are looking at can be required in accordance with the ordinary customers of steel stainless steel materials may be appropriate to reduce costs. In the name of health, you should buy this powerful food metal detector device. Only in this way can we protect our health and benefit. Go and choose one!